Chippewa County (pop. 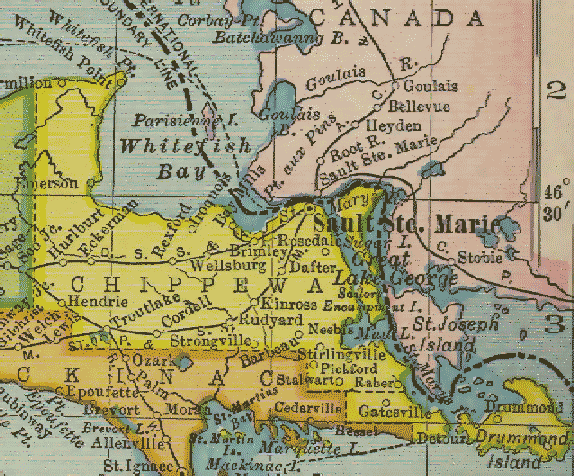 38,520) borders the far southeastern corner of Lake Superior at Whitefish Bay and extends along the Canadian border to the northwestern corner of Lake Huron. Minnesota and Wisconsin also have Chippewa counties. The county seat of Chippewa County is Sault Ste. Marie (pop. 14,144), the second-largest city on the Upper Peninsula. 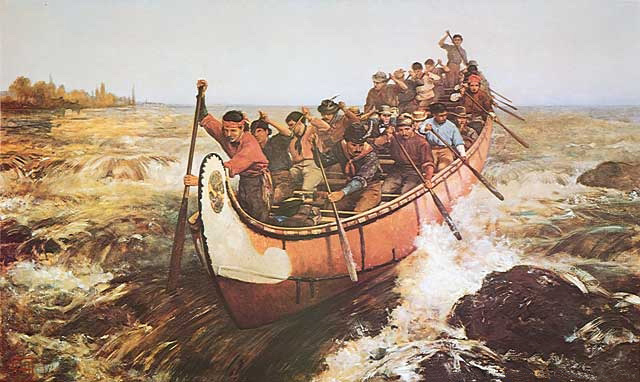 “Sault” (pronounced “Soo” in English) is an archaic spelling of a French word meaning “rapids” – referring to the rapids of the St. Marys River. 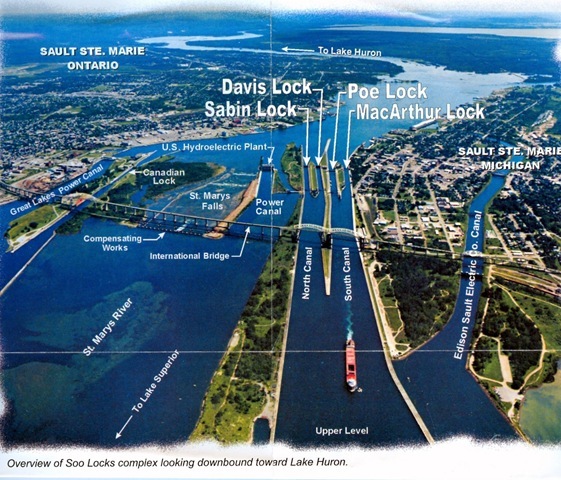 The Soo Locks bypass the rapids, allowing ships to pass between Lake Superior and Lake Huron. About 10,000 ships a year go through the locks. The site of Sault Ste. Marie was a longtime Native American settlement. In 1668, Father Jacques Marquette founded a mission there – the first European settlement in the Midwest. It became a center of fur trading. Today, Sault Ste. Marie is the northern terminus of Interstate 75, which goes 1,786 miles south to Hialeah, Florida. Saulte Ste. 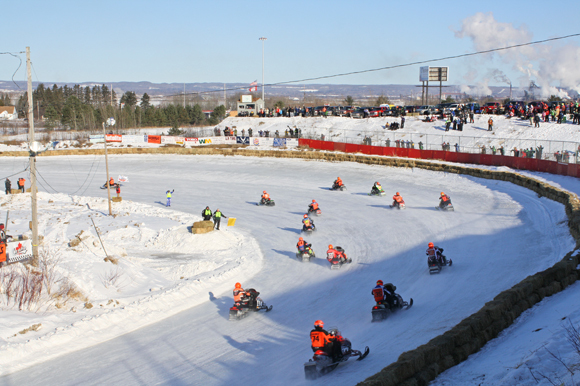 Marie is the home of the International 500, the largest and longest snowmobile race in the world. Riders go 500 miles on a one-mile oval. Lake Superior State University is in Sault Ste. Marie. Established in 1946, it is Michigan’s smallest public university, with about 3,000 students. The athletic teams are called the Lakers. 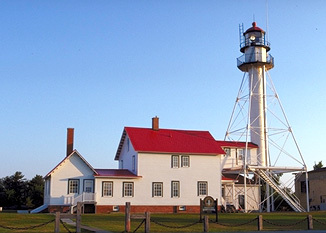 In the northwestern part of Chippewa County is Whitefish Point, where the lighthouse safeguards the route from Lake Superior into Whitefish Bay and the St. Marys River. The current structure dates from 1861. Nearby is the Great Lakes Shipwreck Museum, dating from 1985. At the opposite end of Chippewa County – and at the easternmost point in the Upper Peninsula – is DeTour Township. Three miles offshore, in Lake Huron, is the DeTour Reef Light (1931). 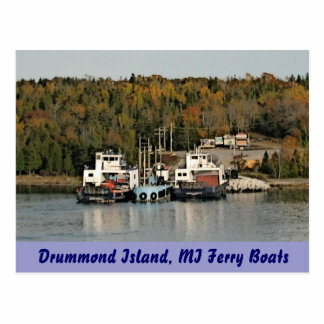 Just east of DeTour Township is Drummond Island (pop. 992), which is reached by car ferry. This entry was posted in Michigan and tagged DeTour Reef Light, Drummond Island, Great Lakes Shipwreck Museum, International 500, Saulte Ste. Marie, Soo Locks.